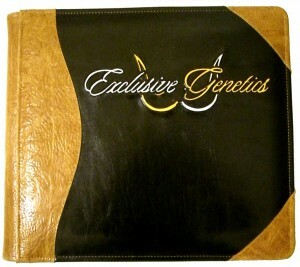 Leather Photo Albums Personalized for You! For whatever you may be planning, we can personalize an album for you. If you are searching for an album that can be embossed, engraved, or stamped with your art on the cover you may want to consider the inlay method of personalization. The beauty of the inlay method is that much more freedom of design exists, and it will always be as beautiful as the day that it was created. We begin by examining your artwork, which may be emailed to us, or helping you to find a design which will suit your purpose. We then will create a mock up in Photoshop for your approval, and work with you until you’re satisfied with the design. The next step is to take the order. We use the art from the mock up to begin cutting your design, by hand, from the cover leather. The different color fields will be created by sewing the appropriate leather in behind the cover leather. Details may be created by using stitching for embellishment. The edges are all skived ( hand tapered ) to half their thickness to eliminate bulges and bumps. After cutting, the edges of the cut leather are colored to make the images are as clean and crisp as possible. Although this method is very time consuming and labor intensive, the finished product is much more impressive than any other method available. The work becomes unquestionably custom, and an inherent part of the photo album cover which will last the lifetime of the book.